Fulcrum Biometrics is your one stop shop for all your biometric needs. We offer hardware compatible with America’s leading pawn management software systems: Bravo, CompuPawn, Hi-Tech Pawn, PawnMaster, Pawn Wizard, PawnDex, SuperPawn, and Xpawn. With or without pawn management software, we have what you need to submit to online reporting systems like California Pawn and Secondhanddealer System (CAPSS), Leadsonline, BWI, RapidNet, RISS, WSIN, NESPIN, or Safe Reporting. Purchase a CAPSS specific bundle or give us a call for individualized help. We will specify hardware compatible with your existing software. We can build customer lookup ability into your software. We can specify multiple modes of biometrics to increase your security (iris, face, etc.). Shop Fulcrum Biometrics for hardware and software bundles at great low prices. Discover the value of hardware and software together. Biometric technologies offered from Fulcrum Biometrics are the most accurate and reliable authentication possible. FS88H uses advanced CMOS sensor technology and precise optical system to meet the rigorous requirement on fingerprint image quality of PIV-071006. 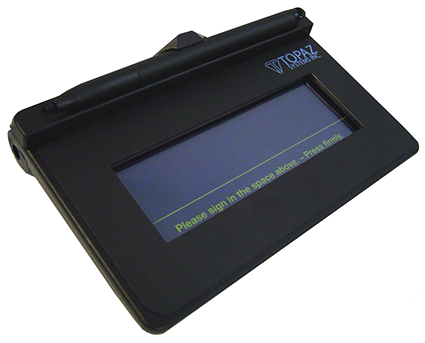 The SigLite T S460 features all the high quality biometric and forensic capture techniques of a SignatureGem® tablet but with a low-cost touchpad and stylus in place of the active electromagnetic pen and sensor. Management system developers: Fulcrum can add biometrics to your application not only for mandatory image captures, but to make the customer experience better, faster, safer, and more reliable. Fulcrum Biometrics is a member of the California Pawnbrokers Association. Fulcrum Biometrics is a leading biometrics vendor that has been operating in the biometrics space for over 15 years with significant impact in a variety of vertical markets, including law enforcement, military, border control, national voter systems, retail, healthcare and benefits management.